Yum! Look at these tasty blueberries. That's because they're hiding. Look closely. And be very, very quiet. 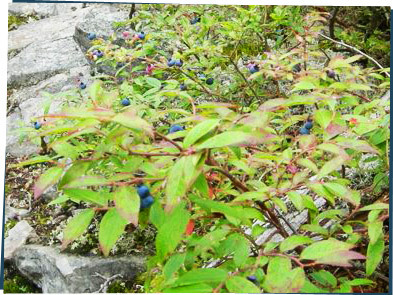 These are wild blueberries, and they're shy. You're right, Dex, they are wild blueberries, but that doesn't mean they're shy. It just means they're really little and grow close to the ground. The blueberries we buy at the supermarket come from a different plant. Those have been specially grown to be big and easy to pick because that's how humans like them. But if you go hiking, especially in Maine, and you keep your eyes peeled, you'll find this tasty treat!